“We have never heard anything false from you throughout our lives”. “O people of Quraysh! Save yourselves from fire. I cannot do anything for you in the presence of Allah. I warn you of painful torture!” Then he added: “My position is like that of a watchman, who observes an enemy at a far-off point and immediately runs to his people for their safety and warns them of the impending danger by saying ‘Ya Sabahah’ in the particular manner”. Secondly steadfastness and effort in the path of its attainment. Faith is the inner stimulant which perforce pushes man to his object and invites him day and night to attain his aim. He firmly believes that his welfare, supremacy, prosperity and good end are associated with it. And, in view of the interest which man takes in him, whenever he develops faith and confidence the strength of his faith automatically directs and persuades him to overcome all difficulties and keeps him away from every doubt, notwithstanding the fact that his prosperity may be dependent upon the attainment of a specific target. For example, a sick man, who knows that his remedy and welfare lies in taking a bitter medicine, takes it easily, and a diver who believes that there are precious gems beneath the tides of the sea throws himself into the mouth of the tides without any apprehension; and returns to surface, after achieving his purpose. However, if the ailing person or the diver are doubtful about the achievement of their objects or do not at all believe in the usefulness of their job, they either do not take any steps in that direction or, even if they do, they are faced with hardship and anguish. Hence, it is the very strength of belief and faith which solves all difficulties. Nevertheless, there is no doubt about the fact that achievement of one’s target is associated with difficulties and obstacles. It is, therefore, necessary for us to combat against those hurdles and to make necessary efforts in that behalf, so that all the obstacles may be removed with our full might. It has been said since olden times that wherever there is a flower (a prized object) there is also a thorn (difficulty) with it. The flower should, therefore, be plucked in such a way that the thorn does not prick one’s hands or feet. “As for those who say: ‘Our Lord is Allah,’ and take the right path……….”(Surah al-Fussilat, 41:30). (Viz. those who have faith in Allah and believe in a particular aim and then display steadfastness and fortitude will definitely achieve their object and are helped by the angels). As a result of the special contacts of the Prophet before the ‘general invitation’ and his indefatigable efforts thereafter, a selected and faithful team came into existence against the forces of infidelity and idolatry. The Muslims, who had embraced Islam secretly before the ‘general invitation’, developed complete acquaintance with those who responded to the Prophet’s call thereafter and the bells of danger rang in all the assemblies of infidelity and polytheism. No doubt it was quite easy for the strong and well-equipped Quraysh to crush a newly-born movement, but the reason for their being afraid was that the members of the movement did not belong to only one family but persons belonging to various families had also embraced Islam. Hence it was not easy for Quraysh to take a decisive action. After mutual consultations the chiefs of Quraysh decided to remove the very foundation of this faith and the founder of the new religion by different means. They proposed to achieve this purpose by approaching him sometimes with allurements and at other times by extending to him various promises and occasionally by using threats and torture. For ten years Quraysh behaved in this manner and eventually they decided to kill the Holy Prophet. In order to save him, therefore, Allah ordered him to quit Makkah. “O Abu Talib! You are superior to us in the matter of nobility and age. However, we met you earlier and requested you to restrain your nephew from propagating the new religion, but you did not pay any heed to our words. The position had now become unbearable for us. We cannot tolerate any longer that a person should abuse our gods and should consider us to be foolish and ignorant. It is necessary for you to restrain him from all these activities, failing which we will fight against him as well as against you, who are his supporter, so that the duty of each group should become specific and one of them should be wiped out”. “Dear uncle, I swear by Allah that even if they place the sun in my right hand and the moon in my left hand (i.e. even if they provide me with rule over the entire world) I shall not desist from propagating my religion and pursuing my object, and shall continue my efforts until I overcome the difficulties and achieve my final goal or lay down my life for its sake”. “O Abu Talib! Walid’s son is a young man, who is a poet and is also handsome and intelligent. We are prepared to hand him over to you so that you may adopt him as your son and cease supporting your nephew”. “You are doing a great injustice to me. You wish that I should nurture your son and surrender my dearest child to you so that you may kill him. I swear by Allah that it will not be so”. “The offer made by Quraysh is quite fair, but you are not going to accept it”. “You have not been just and I am sure that you want to humiliate me and to instigate Quraysh to fight against me. However, you are free to do what you can”. “The elders of your tribe have come and request that you should refrain from criticizing the idols so that they, too, may leave you alone”. “I don’t desire anything from them. As against these four offers they should accept one word from me so that, under its auspices they may rule the Arabs and make non-Arabs their camp followers”. “We are prepared to hear you ten times”. “My only word is that you should admit Oneness of the Lord”. “By Allah! Even if you place the sun in my right hand and the moon in my left hand so that I may abandon my call, I will not rest until Allah makes my religion prevail or I lay down my life for its sake”. Till that time Quraysh had, during all their encounters with him, preserved his respect, but when they saw that all their conciliation offers had failed they were compelled to change the course of their thinking and to forestall the expansion of Islam at all costs and to utilize all means for this purpose. Hence the council of Quraysh decided unanimously to practice ridicule, torture and intimidation to restrain the Prophet from pursuing his object. It is evident that a reformer who is anxious to guide the people of the whole world must observe patience and fortitude in the face of inconveniences, intimidations, dastardly attacks and corporal and mental blows, so that by and by he should be able to overcome difficulties, and this has been the policy of other reformers as well. We give below an account of some of the persecutions and tortures of Quraysh so that the extent of the Holy Prophet’s patience and fortitude may become manifest. 1. One day Abu Jahl saw the Prophet in Safa and abused and grieved him. The Prophet did not speak to him at all and went away to his house. Abu Jahl also went to join Quraysh who had assembled by the side of the Ka’bah. Hamzah, who was the uncle and foster-brother of the Prophet, also returned on that day from hunting and was carrying his bow on his shoulder. It was customary with him that after returning to Makkah and before seeing his children and relatives, he went to the Ka’bah and performed ‘tawaf’ (circumambulation) and then went over to the different groups of Quraysh who gathered round the Ka’bah and exchanged greetings with them. “O Abu ‘Ammarah, (the patronymic of Hamzah) I wish that you had been here a few minutes earlier and had seen the incident which I have seen! Then you would have learnt how Abu Jahl has abused and persecuted your nephew”. “You abuse him (the Prophet) and I have embraced his religion and am treading the same path which he treads. If you possess any strength, come on and fight with me”. This admitted historical fact shows that Hamzah, who later became one of the greatest commanders of Islam was a highly influential and brave personality. He did all he could to protect and defend the Holy Prophet and strengthen the group of Muslims. As Ibn Athir says,152 Quraysh considered the Islam of Hamzah to be one of the greatest factors for the advancement and strength of the Muslims and they, therefore, resorted to other plans which will be mentioned later. “Yes. I am the person who says this”. Later (for some reasons) those people desisted from maltreating the Prophet and he went his own way, whereas Abu Bakr proceeded to his own house with an injured head. Although this incident may be an evidence of the Caliph’s sentiments for and interest in the Prophet it is, first of all, a firm evidence of his weakness and fear. It shows that at that time he did not possess either strength or an appreciable social status. And as a practical step by Quraysh against the Prophet might have entailed evil consequences, they left him alone and directed the severity of their action towards his companion and broke his head. If you place the incident of Hamzah which clearly shows his valour and bravery side by side with this episode you can very well decide as to whose Islam a greater effect had in the early days of Islam on the honour, strength and fear of the unbelievers. You will soon read about the Islam of Umar. His Islam also, like that of his old friend, did not strengthen the defensive power of the Muslims. But for ‘As bin Wai’l it was possible that the blood of the Caliph might have been shed on the day he embraced Islam, because he (‘As bin Wai’l) came and addressed the group, who wanted to kill Umar, in these words: “What do you want from a man who has adopted a faith for himself? Do you think that the family of Adi will surrender him easily?” This sentence shows that it was the fear of his family which made others spare him and defence by the families of those who belonged to them was something natural and usual and there was no difference in this regard between the low and the high. Yes! The base of defence of the Muslims was the house of Bani Hashim and the heavy burden of the task lay on the shoulders of Abu Talib and his family, for, as regards other persons who joined the Muslims they did not possess the requisite strength even to defend themselves, and the question of their Islam becoming the source of the dignity and exaltation of the Muslims did not, therefore, arise. “There appeared before my eyes a scene which I had never seen before in my life. It was for this reason that I abandoned my plan”. “We shall protect you from the mischief of those who mock”. The torture and persecution to which the Holy Prophet was subjected by his uncle, Abu Lahab and his wife, Umme Jamil was unprecedented. He happened to be a next-door neighbour of theirs. They did not refrain from throwing any sort of dirt on him, and one day they threw the entrails of a sheep on his head. Eventually Hamzah, with a view to take revenge, thrust the same on the head of Abu Lahab. In the early days of the prophetic mission the advancement of Islam was the result of a number of factors, one of which was the steadfastness of the Prophet and his companions and supporters. Examples of the patience and fortitude of the leader of the Muslims have already been stated, whereas the forbearance and perseverance of the Muslims who lived in Makkah (the centre of polytheism and idolatry) deserves attention. An account of their sacrifices and steadfastness will be given in the chapters relating to events after Hijrah (migration to Madina). For the present we mention the tragic events connected with the lives of some old devotees of the Prophet who lived in the shelterless environments of Makkah. ‘Ahad! Ahad!’ (viz. Allah is One and I will never revert to the religion of polytheism and idolatry). “He is the leader of infidelity and must be killed”. On his insistence the father and the son were recompensed for their crimes and were put to death. “The idolaters compelled these three persons to quit their house in the hottest season and to spend their time in the heat and the scorching wind of the desert. This torture was repeated so many times that Yasir succumbed to his troubles. One day his widow Sumayyah quarrelled with Abu Jahl on this account. That hard-hearted and cruel person thrust a spear in her heart and killed her also. The Holy Prophet was very much moved on account of the persecution to which they were subjected. One day he saw them being tortured; He turned his face to them with tears in his eyes and said “O family of Yasir! Be patient, for your place is in Paradise “. “My heart is abounding with faith”. “Do not entertain the least fear in your mind and keep your faith hidden to save yourself from their mischief”. It is said that Abu Jahl decided to take to task the family of Yasir who belonged to the class of the most unprotected persons in Makkah. He, therefore, ordered that fire end scourage might be made ready. Yasir, Sumayyah and Ammar were then dragged to the appointed place and tormented with the point of the sword and with the flames of fire and whipping. This persecution was repeated so many times that Yasir and Sumayyah consequently breathed their last, but they did not forsake the praise of the Prophet till their last moments. The men of Quraysh who had witnessed this calamitous and tragic scene, notwithstanding the fact that they had unity of interest in defeating Islam, got the wounded and grief stricken Ammar released from the clutches of Abu Jahl so that he might bury his parents. Whatever has been said above was by way of example, for otherwise the number of self-sacrificing devotees of Islam who endured the gravest hardships during the early days of the Prophet’s mission, and showed steadfastness in the path of achievement of their aim, is much larger However, we refrain from mentioning their names and the events of their lives for the sake of brevity. Abu Lahab: He was the neighbour of the Prophet. He did not miss any opportunity of contradicting and torturing him and the Muslims. Aswad bin Abd Yaghus: He was a clown. As and when he saw the helpless and indigent Muslims he ridiculed them and said: “These poverty-stricken people consider themselves to be the kings of the world and think that they will soon possess the throne and the crown of the Emperor of Iran”. However, death did not allow him to see with his own eyes as to how the Muslims had acquired the lands, thrones and crowns of Kaiser and Kisra. Walid bin Mughayrah: He was an old man of Quraysh who possessed enormous wealth. We shall record his conversation with the Holy Prophet in the following chapter. Umayyah and Abi sons of Khalaf: One day Abi brought the decayed and worn out bones of some dead persons to the Holy Prophet and asked: “Can your Allah restore these bones to life?” Right came the reply from the source of revelation: “Say, the Lord who created them first will bring them to life again”. These two brothers were killed in the Battle of Badr. Abul Hakam bin Hisham: The Muslims used to call him Abu Jahl (father of ignorance) on account of his unwarranted enmity and fanaticism against Islam. He, too, was killed in the Battle of Badr. ‘As bin Wai’l; He was the father of Amr ‘As. He was the person who had given the nickname of ‘Abtar’ (issueless) to the Holy Prophet. ‘Uqbah bin Abi Mu’it:162 He was one of the fiercest enemies of Islam and never missed an opportunity to do harm to the Holy Prophet and the Muslims. There was also another group of the enemies of Islam including Abu Sufyan and others. The historians have recorded the particulars in detail and for the sake of brevity we refrain from reproducing them here. The acceptance of Islam by every one of the early Muslims was the effect of one cause or another and at times a very small incident became the means of the conversion of an individual or a group. The stimulant for the adoption of Islam by the second caliph is interesting. Although from the point of view of the chronological order of the events it would have been appropriate to record this incident after describing the migration of Muslims to Ethiopia, but we have considered it expedient to describe it here, as we have here mentioned some of the companions of the Holy Prophet. The confused condition of the people of Makkah had made Umar very sentimental, for he saw that dissension and disorder prevailed amongst them and the bright day of Quraysh had been changed into a dark evening. Umar, therefore, decided to go and cut off the root of dissension by killing the Holy Prophet. To achieve this purpose he was looking for the place where the Prophet could be found. He was informed that he was in a house situated by the side of the bazaar of Safa, and forty persons like Hamzah, Abu Bakr, Ali etc. had undertaken to protect and defend him. “I saw Umar carrying his sword. I enquired about the purpose for which he was going. He replied thus: “I am going in search of Muhammad who has created dissension amongst Quraysh. He laughs at their wisdom and intellect, declares their religion to be worthless and belittles their gods. I am going to kill him”. “I said to him: You are deceived. Do you think the descendants of Abd Munaf will spare your life? If you are a peaceable person you should first reform your own house. Your sister Fatimah and her husband have become Muslims and follow the religion of Muhammad”. Na’im’s words created a storm of wrath in the mind of Umar. Consequently he abandoned his previous plan and went to the house of his brother-in-law. When he reached near the house he heard the humming of someone who was reciting the Holy Qur’an with an impressive voice. The manner of Umar’s arrival in his sister’s house was such that she and her husband also became aware that he was about to enter. They, therefore, concealed the teacher of the Holy Qur’an in the back part of the house so that he might remain hidden from Umar’s eyes. 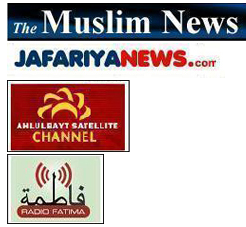 Fatimah also concealed a leaf on which verses of the Holy Qur’an were written. “I have been informed that you have become Muslims and follow the religion of Muhammad”. “Yes. We have become Muslims and believe in Allah and His Holy Prophet. Do whatever you like”. “Let him come in. If he has come with good intentions we shall welcome him, but if his intentions are not good we shall kill him”. 146. Instead of ringing a bell of danger the Arabs use these words and generally begin alarming reports with them. 147. Ibn Hisham has mentioned the names and particulars of these person in his ‘Seerah’. 148. Seerah-i Ibn Hisham, vol. X, page 265. 149. Seerah-i Ibn Hisham, vol. I, pp. 265-266. 151. Seerah-i Ibn Hisham, vol. I, p. 313 and Tarikh-i Tabari, vol. II, p. 72. 152. Tarikh-i Kamil, vol. II, page 59. 153. al-Bidayah wan Nihayah, vol. III, page 26. 154. Seerah, page 311. Tabari has quoted the entire incident in his history vol. II page 72, except that the head of the Caliph was injured. 155. Tarikh-i Kamil, vol. II, page 47. 156. Biharul Anwar, vol. XVIII, page 204. 157. Seerah-i Ibn Hisham, vol. I, page 318. 158. Tabaqat-i Ibn S’ad, vol. III, page 233. 159. Tarikh-i Kamil, vol. II, page 45. 160. Seerah-i Ibn Hisham, vol. I, page 320. 161. Seerah Ibn Hisham, vol. I, page 314. 162. Tarikh-i Kamil, vol. II, pp. 47-51; Usudul Ghabah; al-Asabah al-lst’iab etc. 163. Seerah Ibn Hisham, vol. I, page 365.